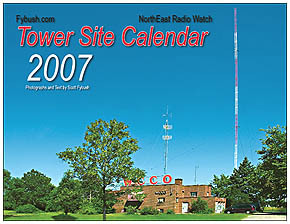 TOWER SITE CALENDAR 2007 - NOW SHIPPING!!! *As a general rule, we here at NERW don't get too excited about format-flip stunts, especially when they're on little rimshot FM signals in upstate NEW YORK. But a stunt currently underway on Clear Channel's WNVE (107.3 South Bristol) has somehow ended up garnering nationwide attention, at least among the media-geek crowd, and somehow we ended up getting name-checked along the way - and so we lead off this week with the oddity that is "Huge 107.3 FM." It's been a little over two years since Clear Channel executed a signal swap that moved classic hits "Fox" WFXF, the only format that had ever really been successful on 107.3, over to the much bigger 95.1 Honeoye Falls signal. The 2004 swap landed modern rock "Nerve" WNVE on 107.3, where the format couldn't even reach most of its former core audience close to the city of Rochester. Without Howard Stern, who'd been dumped from the 95.1 incarnation of Nerve in April 2004 as part of a larger Clear Channel corporate dispute, WNVE didn't have much going for it, and in recent months it ran almost completely automated, with just a handful of voicetracks and no live jocks. So it was no big surprise when, with no fanfare at all, the plug was pulled on the Nerve last Wednesday night at midnight. What was a surprise - at least to some extent - was the stunt format that replaced it - "Huge 107.3 FM," a stunt with a sponsor, Fucillo Hyundai. Fucillo has made a name for itself in other upstate markets with a saturation level of advertising that all but ensures that anyone watching TV, listening to the radio or seeing any outdoor ads is exposed (repeatedly) to its "Huge" slogan. Fucillo says it's struck a "seven-figure" ad deal with Clear Channel to launch its new dealership, and "Huge 107.3" appears to be a clever part of that deal. In practice, it's nothing more than the "spin the wheel of formats every hour" stunt that we've heard in plenty of other markets - the choices thus far have included everything from classic country to disco to "songs by people named Bob and Tom" - but this time, it's all branded with the sponsor's name, and it's garnered a surprising amount of media coverage. "Fybush cried "Stunt! "/R&R asked "Jazz?"/"Snap!" cracked the competition/As if to razz"
Shakespeare it ain't...but it's certainly an amusing way to pass a long holiday weekend, and we'll be listening this week to see what comes next at 107.3. If you're not a current subscriber - or if your subscription has lapsed - now's the time to fix that. Click right here to subscribe...and we'll gladly put you first on the list for the 2007 Tower Site Calendar (now shipping). *In New York City, Friday was moving day for Air America Radio, which moved from Inner City Broadcasting's WLIB (1190) to Access.1's WWRL (1600). WLIB relaunched Friday morning with black gospel, while WWRL retained its Sam Greenfield/Armstrong Williams morning show, followed by Air America's Jerry Springer, Al Franken, Randi Rhodes and Sam Seder - but not Mike Malloy, whose late-night Air America show was abruptly cancelled last week. Down the dial at WOR (710), Bob Grant has departed - again. The fiery veteran talk host left his full-time afternoon gig at WOR in January, but returned to the station with morning-drive commentary segments in February. Those, too, came to an end last Friday. WCBS (880) has hired a new afternoon anchor. Steve Scott comes to the all-news station from WLS (890) in Chicago, where he's spent 13 years, the last ten as news director. On the FM side of the ledger, WKTU (103.5 Lake Success) has a new afternoon team, beginning today, as Hollywood Hamilton returns from Los Angeles (where he was last heard doing mornings on oldies KRTH) to reunite with his old partner, Goumba Johnny, in the 2-6 PM slot. Goumba, of course, had last been heard in mornings on WKTU, the slot now occupied by Whoopi Goldberg. In Binghamton, WSKG is looking for a new president/CEO following the departure of Gary Reinbolt, who led the public radio and TV operation there since 1999. Over on the commercial side of the Binghamton dial, Don Brake is the new PD at WHWK (98.1), replacing the departed Ed Walker. In Albany, Gabby is the new APD/music director/midday jock at Clear Channel's WHRL (103.1), filling the post last held by Capone, who's now the station's PD. In Watertown, Johnny "Keegan" Tunstall has quit his job as PD of WOTT (100.7 Henderson), in the midst of an ownership change at the rock station. Tunstall told the Watertown Daily Times that he was unhappy about guest DJ segments that broke the format of the station - and he's accusing the station's former owners of payola, an allegation that was made earlier by attorney general Elliot Spitzer, but which the former owners, Clancy-Mance Broadcasting, denied. In Utica, they're planning a reunion of former staffers at WTLB (1310). It's scheduled for Sept. 23, and if you're a WTLB alumnus and you're not already planning to be there, get in touch with Joe Tierno (enzioyes at verizon.net) for more information. And here in Rochester, we can't let the week go by without wishing a happy 40th anniversary to WXXI, which put its TV station on the air (on channel 21, hence the calls) on September 6, 1966. WXXI (where your editor is a part-time newsperson, on the radio side) will mark the anniversary with an open house September 30. *In PENNSYLVANIA, Clear Channel has new calls for its two recently-flipped Philadelphia signals. Mark down "WISX" for "Philly 106.1," the former WJJZ - and "WUBA" for "Rumba 104.5," the station formerly known as WSNI. Across town, Kannon is staying put at WRDW (96.5) as assistant PD/afternoon jock, rather than taking the job he'd been offered as afternoon jock at WKSC in Chicago. In the Reading market, Nassau's WFKB (107.5 Boyertown) has filled out its airstaff. In addition to PD Randi Ellis in middays, "Frank" now has a morning show, with Ken Johnson (late of KSFN Las Vegas) and Jenn Ryan (late of WSNI). Brian DiMario of sister station WTHK (97.5 Burlington NJ) adds afternoon duties, and John Von (formerly of WRDX in Delaware) comes on board as production director and night jock. Another format and call change in State College? Yup - the WBHV calls (long a fixture at 103.1) have returned to Happy Valley, this time on 2510 Licenses' signal at 94.5, formerly smooth jazz WSMO. It's now doing top 40 as "B 94.5." The new format debuted last Monday (Aug. 28) at midnight. *In RHODE ISLAND, WSTL (1220 Providence) returns to the air today under its new ownership. It'll reportedly be "Shine 1220" when it signs on at 6 AM. Over at WPRI (Channel 12), they're mourning Dickie Lynch, who died August 18 after a long battle with cancer. Lynch had been with WPRI since 1978, most recently serving as the station's special projects coordinator and production manager. Lynch was 52. *The management shuffle at Clear Channel is hitting home in MASSACHUSETTS, where Janet "Jake" Karger lost her job as Boston market manager/regional VP on Thursday after ten years with the company. Karger's duties at WXKS/WJMN/WKOX will be taken over by Mike Crusham, who moves north from Florida to become Clear Channel's regional VP for New England and upstate New York. "ESPN Boston," WAMG (890 Dedham)/WLLH (1400 Lowell), has picked up the rights to "Patriots Friday." Beginning this Friday, afternoon host Mike Felger will anchor the all-Pats show, weekly from 4-7 PM. Where are they now? Onetime WBZ PD Tyler Cox is departing Salem's talk network to return to the PD chair at ABC's WBAP (820 Fort Worth), which was his destination when he left WBZ in 1992. *In VERMONT, the Radio Free Brattleboro saga has finally come to a close with the debut of the station's licensed LPFM successor. Vermont EarthWorks put WVEW-LP (107.7 Brattleboro) on the air last week, returning much of the community programming to the air that went away when a federal raid silenced the unlicensed RFB operation. In Randolph, Clear Channel flipped simulcasts at WWWT (1320) last week. Instead of carrying the talk programming of WSYB (1380 Rutland), which is being sold, 1320 is now WTSJ, the latest link in the news-talk network based at WTSL (1400 Hanover NH). *The last CBC Radio One AM signal to bring the news of CANADA across the border to New England could soon move to FM. Fans of the CBC in the US have already weathered the loss of CBL (740 Toronto) and CBM (940 Montreal), and now the CBC is applying for permission to silence the AM signal of CBA (1070 Moncton NB). If the move is approved, CBA would move to 106.1, with 69.5 kW/211 m - and New Brunswick would be down to its last four AM stations. Also applying for an AM-to-FM move is CHVO (560 Carbonear NL), part of the VOCM network across Newfoundland. Newcap wants to move the station to 103.9, with 30 kW DA/124.1 m.
A happy 20th anniversary (Thursday) to Quebec's TQS television network, which marks the occasion with a new logo. Things aren't so happy, we hear, at the Global television network, where the "Sportsline" show that had been a fixture for most of the network's history in Ontario was cancelled last week. At least three full-time staffers, plus many part-timers, lost their jobs in Global's sports department. We're also told that Global has now moved all its master control operations from Ontario, Quebec and the Maritimes to a facility in Alberta. And we'll close by noting that Moses Znaimer's C$12 million acquisition of CFMX (96.3 Toronto/103.1 Cobourg) has been approved by the CRTC. What changes might be on the way at "Classical 96.3"? It's been a busy week for Hall Communications - first, the Connecticut format changes we told you about in our last issue, and now a major station purchase in the Burlington, VERMONT market. Hall was already a major player in town, with market-leading country giant WOKO (98.9 Burlington), standards WJOY (1230 Burlington) and oldies WKOL (105.1 Plattsburgh NY). Now, for $17 million, it's adding Burlington Broadcasters' two stations - classic rock WIZN (106.7 Vergennes) and modern rock WBTZ (99.9 Plattsburgh). (WBTZ is actually still owned by Plattsburgh Broadcasters, and Hall assumes Burlington's right to purchase the station, as well as an LMA until the sale closes.) Hall says it won't change anything at WIZN and WBTZ, and we tend to take that statement more seriously when Hall's involved. The stations will stay at their current home on the south edge of downtown Burlington, too. On the TV dial in NEW HAMPSHIRE, WZMY (Channel 50) in Derry has unveiled its new schedule. Gone is the station's 10 PM newscast, but news at 7:30 PM remains, under the name "My TV Now." And from 9-10 PM daily, "My TV" will offer "My TV Prime," a local talk show. The station says it's also considering bringing back Candlepin Bowling later in the fall. A station sale in MAINE: Franklin Broadcasting is selling WKTJ (99.3 Farmington) to Clearwater Communications for $450,000. Clearwater brokers WSKW/WCTB/WHQO in Skowhegan from Mountain Wireless. In Rochester, Sinclair's "News Central" departed WUHF (Channel 31) in a classy way Wednesday night, with a lengthy credit roll listing the 120 or so staffers who've passed through the doors at 360 East Avenue since the news operation began there in 1997. WUHF's remaining staffers (about half of the 50 or so people who worked there on August 31) moved into their new home at Nexstar's WROC-TV (Channel 8) on Thursday; the new WROC-produced 10 PM news on WUHF will debut around November 1. A quick note from MAINE that the WCLZ calls have returned to 98.9 in Brunswick, though with no change to the "Point" nickname and modern AC-ish format that the station's been using as WTPN. The interim home of the WCLZ calls, 95.5 in Topsham, is now WJJB-FM to match the sports simulcast with WJJB(AM) (900 Brunswick) and WJAE (1440 Westbrook). Greater Media's Boston stations sorted things out this morning, and here's where everything settled down: Country music stays at 96.9, but under the WKLB-FM calls that move over from 105.7. The jock lineup on the new "Country 96.9" is still unclear, but so far this morning, your NERW has already heard WBCS veteran Carolyn Kruse and longtime fill-in guy Bill Heckbert. Greater Media saves its million dollars this way, as long as they keep 96.9 country through the end of the year (and with no competition, why not?) Still missing at 96.9 is a strong morning show; we'll see what pops up there. Over at 105.7, the new calls are WROR-FM, and the new format is being officially described as "60s, 70s, and 80s." What it really sounds like, though, is another oldies station in town, with a smattering of 70s and 80s soft AC and without the 50s music on Boston's established oldies outlet, CBS's WODS (103.3). The key players here are morning veterans Loren (Owens) and Wally (Brine), who also picked up WBCS's Tom Doyle along the way. The strategy? Seems like Greater is trying to bracket its big AC, WMJX (106.7), while taking a bite out of Oldies 103 at the same time. It's nice to hear the WROR calls back in town; that's where a lot of this music was first heard in Boston, in the old 98.5 days. Radio with pix: Boston's CBS-owned WBZ-TV took on a new identity one day ahead of schedule on Monday, becoming "News 4 New England" with a new set, a new logo, and almost no mention of its calls...New Bedford's WLWC (28) should be on the air soon. They're advertising for staff in Broadcasting and Cable, confirming the speculation that they'll be in an LMA with NBC's WJAR-TV (10) Providence. And WRKO talkers Pat Whitley and Marjorie Clapprood are back to radio-only. New England Cable News has dropped its telecast of the 5:30 to 7am portion of the show in favor of its own morning newscast. *It's here! Tower Site Calendar 2007 is now shipping, and if you took advantage of our pre-order offer, your calendar should be arriving in your mailbox any day now.